Ioannis Gardens represents a rare opportunity to be close to all amenities yet also be within an idyllic and tranquil holiday complex in central Kato Paphos. This high spec, high quality new development in the Tomb of the Kings area is situated just a short stroll to Tomb of The Kings Road where all main amenities, bars and restaurants can be found. The location is also convenient for Paphos Old Town with its street cafes, retail shops and municipal market stalls. 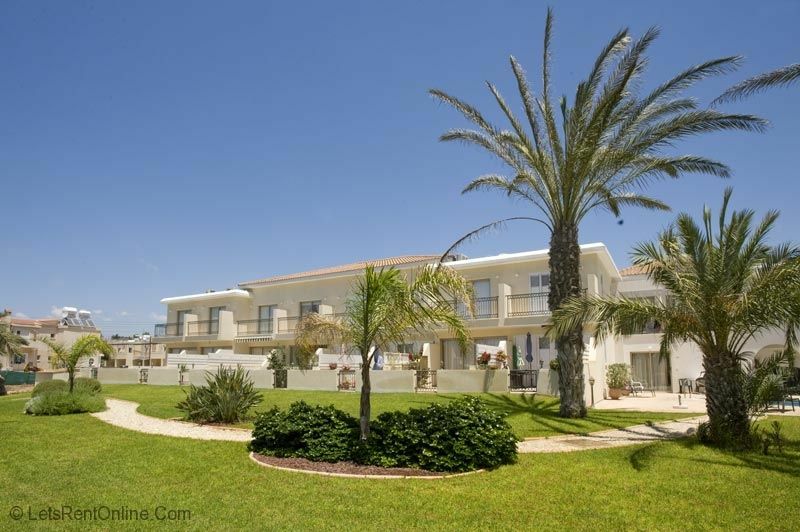 This well appointed two bedroomed townhouse features stunning views of the luscious gardens and the Mediterranean Sea beyond. The large dining lounge area features comfortable leather sofas which easily seats 6 and oak furniture. Sateliite TV and DVD player are included for entertainment. The kitchen is fully equipped with modern appliances and has a smart modern appearance with white units, stainless steel. The full width patio window opens out onto the patio/terrace and small enclosed private garden which features dining table and chairs for up to six. Upstairs, the two bedrooms are equipped with air conditioning, ceiling fans and ample wardrobe space. Both have balconies, the master bedroom having sea views. The clever bed design enables the beds to be made up as 3 foot wide singles or super king sized doubles providing total flexibility what ever your needs. The large bathroom with shower features a vanity unit, over-bath shower screen, glass shelves and towel rails. There is also a downstairs cloakroom for convenience. For your comfort, air conditioning and ceiling fans are standard through out. Towels and linen are also provided as well as extras such as pool towels, hairdryer and safety deposit box. The complex is intimately designed (only 20 apts & 8 townhouses) with character throughout and all apartments benefit from the wonderfully designed pool and garden areas (sun loungers supplied) which are decorated by palm trees (and the rare commodity of grass) allowing children to play happily and safely when they are not in the pool. Other high quality specifications include, controlled and secure entrance to private car parking, door entry systems, elevator to all floors, marble staircases/landings and communal changing rooms and showers. ''Very good property, as expected based on the description. Lovely compound, quiet, clean, private, nice view, close to everything. Wonderful pool! Perfect location, quite central. Near the shopping mall and lots of restaurants. We had a car with us, but it's easily manageable without a car. Shopping: Kings Avenue Mall was perfect. Well known shops, kids play area (3 Euros only), lots of restaurants, and a great supermarket! Beaches: By far, Coral Bay, super clean and sandy. There were other beaches, but not sandy. Restaurants: Most were below average food catered for tourists, but the ones that stood out with service and quality were Duomo (not because of the discount), and Gustoso. Sightseeing trips: we only visited Paphos Zoo, which was a great few hours trip. Bird show was fantastic and giraffe feeding was the highlight for our son. We avoided visiting the archeological sites because of the heat. Excellent service from you before and after booking. Quick to answer any queries. ''Firstly I would like to say the service provided by yourself and lets rent online was First Class, you answered all my e mails quickly and were very helpful, from landing the taxi was spot on, apartment was spotlessly clean and very quiet(just what we wanted),We had no problems during our stay and had a lovely holiday,location was quiet but what we wanted, wouldn't suit all but only a short walk to numerous bars and restaurants. LATE AVAILABILITY DISCOUNT	Bookings of 7 nights or more made within 28 days of travelling discounted by 10% LOW OCCUPANCY DISCOUNT	1-2 guests: 5% Please note that Low Occupancy Discounts do not Calculate automatically on this platform. Please contact us for quote and information if you qualify Only one discount can apply Air-Conditioning Included Welcome Pack of essentials on arrival Laundry change for stays of 10 or more nights Wi-Fi and Premium Channel TV is included. Ioannis Gardens represents a rare opportunity to be close to all amenities yet also be within an idyllic and tranquil holiday complex in central Kato Paphos. This high spec, high quality new development in the Tomb of the Kings area is situated just a short stroll to Tomb of The Kings Road where all main amenities, bars and restaurants can be found. Popular restaurants like Olivetos, Fat Mamas, Artio Brasserrie, Youkoso and many more are within short walking distance. Just 750m away is the &lsquo;Old Town' of Paphos with its municipal market, variety of shops and street cafes where you can literally sit and watch the world go by with your favourite aperitif. Popular and vibrant describe the pretty and charming town of Paphos. Situated on the south western end of the island, Paphos has managed to retain much of the traditional Cypriot charm and character. In the old town, many original qualities and customs still exist. Shopping for the freshest fruit and vegetables is still done early in the morning at the very busy market place. Also to be found at the market are traditional souvenirs, local wares and the very famous Cypriot delights that are made in the local village of Yeroskipou. Combining the old with the new brings you down to Kato (lower) Paphos where you will find a buzzing array of bars, restaurants and shops surrounding the delightful harbour. Paphos, is a jewel in the Mediterranean crown. Beautiful, crystal clear waters, captivating landscapes and scenery, coupled with its attractive year round climate, make Cyprus a very tempting holiday and retirement destination. As well as the main areas of old Paphos town and Kato Paphos, Coral Bay to the west of the town, boasts a lovely sandy beach with friendly and lively restaurants and bars, close by is the enchanting small fishing hamlet of St Georges Bay where you can taste the most succulent freshly caught fish on the Island. A little further out, Troodos mountains provides the surroundings of stunning snow topped mountains looking down on the glistening coastal bay. Hospitable and friendly people are what you will find on the Island of Cyprus. From rural villages surrounding Paphos down to the harbour with its ancient castle and charming restaurants and bars, you will receive a warm welcome and the opportunity to sample some of the finest cuisine in the World. Share a Meze in Cyprus, and you have tasted the true flavours of the Island, this meal offers you a selection of many Cypriot dishes, sometimes up to 30, so an ideal, and certainly filling, way to try all the different options.